I like to keep busy. So today I decided to make a patch work bag. 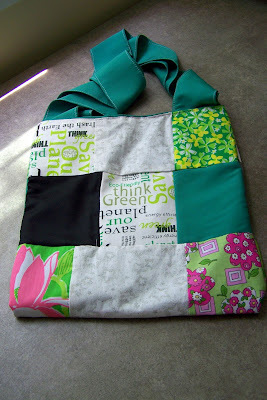 My mom just got some cool “Go Green” fabric (from Contemporary Cloth), so I decided to use it. I found matching fabrics and put it all together. It was quite easy. I lined the inside with a pretty green fabric. What was my inspiration? This fake “Coach” bag, from New York City. I didn’t put any pockets in the bag, like this one, but I figured the “Go Green” bag would be bigger and could fit books or magazines. 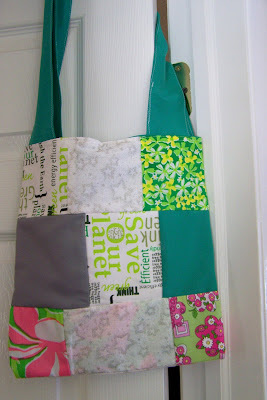 It was a fast and easy project, made just from scraps of fabric.